The term ‘free-to-play’ combining with the phrase ‘in-app purchases’ is enough to send a shudder down the spine of most gamers. Luckily, BitCake Studio’s Holodrive will allow players to have a full experience of the title without spending a thing, once its Early Access period is over. Holodrive is a multiplayer third-person shooter, which boasts a two-dimensional design. 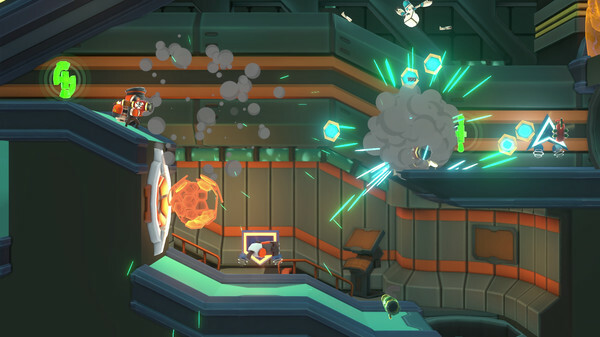 The player is in control of a robot and must run around the levels killing other Bots, while avoiding their own destruction. This is done by making clever use of the environments, the jetpack, and power-ups. While the game lacks a single player campaign or story, it starts new players off with a comprehensive tutorial that quickly explains the controls and different weapon types. The keyboard controls are nice and simple, and there is also full controller support to turn the game into a twin-stick shooter, if you’d prefer. The game currently consists of three different stages, which can be voted for in-between each match. In Deathmatch, it is every Bot for themselves, as players aim to kill each other as many times as possible. Going further, Team Deathmatch is exactly what it sounds like: Deathmatch but with players put into one of two teams. Collection mode mixes things up with Holodrive’s version of capture the flag. Players are put in teams which each have a red or blue glowing orb. The aim is to shoot off points from the enemy orb and get them to your own base, without getting killed in the process. The team with the most captured points at the end wins. The core gameplay is simple and easy to understand, and BitCake Studio has added some interesting aspects to the level environments, allowing for a bit of sneaky strategy on the players’ part. Firstly, there are two bars to the right and left of the player’s Bot that represents their health and jetpack fuel. Health can be regained by finding the green plus signs on the map, while the jetpack fuel runs out quickly while in use, but refills when the player is no longer airborne. An awareness of both is important, as grabbing health while in a fight, or using the jetpack to gain better ground, can result in a quick victory. In addition to the two bars, orange and green arrows will appear in the direction of an enemy or ally Bot when they are close. This provides the player with a way to sneak up on enemies, so as to not waste ammo on allies. Of course, this also means that the enemy team can see the player, but detection can be avoided by hiding in pipes. There are also a few warp points dotted around levels that can provide a quick getaway. The two most influential elements to fights are power-ups and weapons. Walking through boxes with a question mark will award the player with a random power-up (with more unlocking up to level 21). These could allow unlimited use of the jetpack, double damage, a shield, invisibility and other such abilities for a limited amount of time. Used correctly, these provide some great one-ups over enemies. Meanwhile, the weapons all fall under specific categories, and players can pick which gun they wish to fill each slot. For example, Fastfire weapons include the choice between a Plasma Gun, Intimidator and Minigun, with other gun types include Multishot weapons and Continuous weapons. 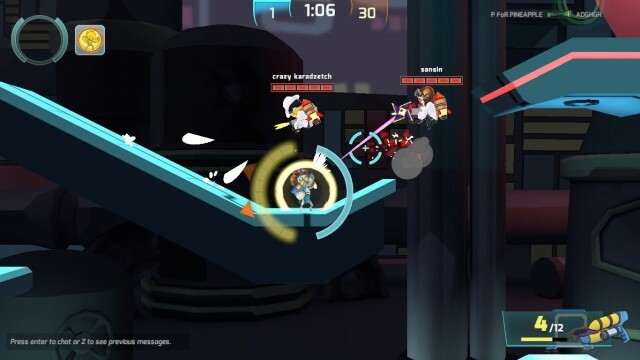 At the start of a match, the player will only have the basic gun available to them, and must quickly pick up more from those that are scattered around the map. Finding the gun that is right for you, and quickly switching between the ones in your arsenal, can be highly rewarding. Blasting through enemies, plus taking advantage of the jetpack and upgrades, all while making use of the environment, is hugely satisfying, especially if that leads to getting the top spot on the leaderboard. When the opposite happens, however, the game can be highly frustrating. As it is possible to be thrown into a match with anyone, I found myself pitted against players at level 50 and 64, while I was only level 8 at the time. They had a better assortment of weapons, due to their higher levels, and I could barely touch them. Just to kick me when I was down, the game would also respawn my Bot right next to an enemy player, to have me be obliterated before I could even left-click the mouse in defence. Of course, this problem could be rectified with better matchmaking, thus leading to a fair and fun combat experience. Without this, a lot of new players aren’t going to be on the servers for very long before getting disheartened and giving up. In addition, players who are ranked 1st, 2nd and 3rd after a match gain the most experience points. This means that those with the most knowledge and best scores get the best rewards, including new weapons and unlocks for their time spent on improving skills. The negative is that low level players will find themselves levelling much more slowly, unable to match the higher level players, and not able to catch up to them due to constantly losing. While the hub screen has a looping energetic tune, the actual game is silent. There are sound effects for when a player uses a jet-pack and shoots a weapon, while power-ups have a unique jingle while in use, but other than that everything feels very quiet. The upside to this is that it increases the player’s concentration, making them feel nervous as they listen out for sounds of gunfire or jetpacks to help them determine their foe’s location. In combination with the ominous lack of music, are the repetitive backgrounds. While there is a diverse amount of different level designs, the roster feels small due to the locations all looking very similar. Although everything is bold and clean in its design, a more obvious change in environments could have done a lot to keep players interested. These negatives can all combine to make each session feel a bit too long. With matches lasting 8 minutes, players may find themselves looking at the timer and sighing when they see that they still have 3 minutes or more left on the clock. While taking a break from the matches, players may wish to customise their roster of weapons, or their Bot’s clothes. To do this, they can return to the hub screen and flick through the menus. 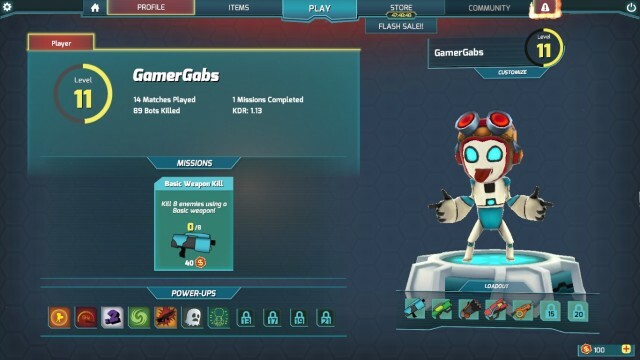 The Album, in the Items tab, shows off the different customizable attire that can be collected for the head, arms, legs, torso and jetpack of your Bot. As many of these costumes range from cool to cute, they can be satisfying to obtain, but other than giving the robot a slightly new look they do nothing. In order to get clothing items, the player must visit the Store, where Holopacks can be bought with Bits (earned through play, or purchased with real money). The Holopacks either give the player one random weapon or custom clothing item. Alternatively, players can opt to get the XP Boost which doubles experience points for 48 hours. These packs are between 120-200 Bits each time, and since Bits are only rewarded for levelling up (10 Bits) or completing the daily mission (40 Bits) it can take a long time to collect items. Much of the negatives come from the ability to be placed with players at a much higher level than yourself, which then combines with the long match times, lack of music and repetitive backgrounds to create a disappointing experience. When the game works it’s really fun, and if the developers can fix these problems, Holodrive has the potential to be a really enjoyable title.